How is Carbon Dioxide Measured? For at least the past million years, hot lava has flowed from cracks in the Pacific Ocean bottom and slowly built the Hawaiian islands. The largest is the island of Hawaii, which is primarily composed of two volcanoes: Mauna Kea and Mauna Loa. If it is measured from its base on the ocean floor, Mauna Loa is the tallest mountain in the world. It rises about 6 kilometers through the ocean water and then continues to climb another 4 kilometers above sea level, where its summit is often shrouded in clouds. Not far from the summit, a small cluster of buildings stands out sharply against the background of barren rock. At this altitude the air is cold and fresh. The nearest continental land mass is 4,831 km away. Far from local sources of contamination, it is a perfect site for a laboratory whose mission, since 1957, has been to monitor changes in the composition of Earth's atmosphere. It was global systems scientist David Keeling who convinced government agencies it was important to monitor the concentration of carbon dioxide in the atmosphere, and the summit of Mauna Loa was the best place in the world for this work. The continuous record of carbon dioxide — which continues to be updated as you read these words — has become one of our most important data sets since it provides evidence the atmosphere is actually changing. Today the data collected at Mauna Loa Observatory and other sites around the world is analyzed by an international network of scientists. In this chapter, we'll talk to scientists in Hawaii and in Boulder, Colorado, to learn about how the concentration of carbon dioxide in the atmosphere is measured and recorded, and to introduce some of the people whose job it is to make and to analyze those measurements. Meet Pieter Tans, a senior scientist and the man who leads the Carbon Cycle and Greenhouse Gases (CCGG) group at NOAA's (National Oceanic and Atmospheric Administration) Earth System Research Laboratory (ESRL) in Boulder, Colorado. CCGG takes continuous measurements from various sites around the world to track the changes in the carbon-cycle. The Mauna Loa Observatory, on the island of Hawai'i, is one of four baseline sites from which samples are collected and then analyzed. Although Pieter is not stationed in Hawaii and does not directly take the samples, he is very much involved in the analysis process and is the leading scientist in the carbon-cycle study. Pieter hadn’t always planned on spending his life studying greenhouse gases. As a student at the University of Groningen in the Netherlands, he pursued a degree in theoretical solid state physics. But he found this subject too abstract for his taste and became disenchanted with his studies. It was while he was looking to change his academic focus that he accidentally stumbled upon the answer while browsing in a neighborhood bookstore. He came across a book called Inadvertent Climate Modification: Report of the Study of Man's Impact on Climate. Intrigued by the title, Pieter began to read it. He was struck by the content, which talked of mankind causing changes to the environment and changing the Earth in a variety of ways, starting first with land use and leading to more drastic destruction. The book's authors went on to talk about the changes in climate and in particular, the increase of CO2 that seemed to be rising without end. Right away, he knew that he had come across something very important, something big that he wanted to be a part of. Inspired by what he had read, Pieter decided to do his master’s thesis on climate change. He worked with an atmospheric scientist from the Dutch Meteorological Institute on a model of radiative transfer in the atmosphere with different amounts of CO2 and clouds. He went on to graduate with a degree in physics. After graduation, he took up an experimental physics lab job at the same university, taking measurements of Carbon-14 and Carbon-13 in tree rings and analyzing the CO2 measurements from the past 200 years. After getting his PhD in 1978, he and his family moved from the Netherlands to San Diego, California where he took up a postdoc with David Keeling of the Scripps Institution of Oceanography. Next, he came to University of California Berkeley to work with Richard Muller in the Astrophysics group at the Lawrence Berkeley Lab, where he worked on carbon-14 dating with a cyclotron high-energy accelerator. Finally, Pieter arrived at Boulder, Colorado, in 1985, where he has been a part of the ESRL team ever since. The oddly shaped buildings, antennas, and towers of the observatory seem like miniatures in a vast field of stark lava. Two of the buildings have domes that make them look like telescope housings, but there are no telescopes inside. Instead there are instruments that constantly sample the air above the mountain for evidence of change. The trip to the Muana Loa Observatory is about an hour and half from the bottom of the mountain. It is a one-lane, winding road that has been paved by past lava flows. The observatory sits atop a hill. It consists of a few small buildings and a 40 meter tall tower. The director of the station is John Barnes (as of 2011), who came to MLO in 1993. Aside from managing the station and being its main point of contact, John spends most of his time doing his own research work. Aidan Colton is the person in charge of the CO2 and flask sampling program at MLO, so he takes most of the air samples that are sent to Pieter Tans' group in Boulder, Colorado. Aidan graduated from Boston College with a BS in Environmental Geosciences and has been working at MLO since 2004. In his senior year of college, Aidan did an internship with the EPA and also worked on research with a professor exploring the ocean’s role in the carbon sink. After graduating, he had been hoping to get a job in atmospheric environmental research, in particular, looking at greenhouse gases and other ozone depleters, so the job at MLO was perfect for him! In addition to collecting air for the ESRL laboratory, Aidan also collects air for the Scripps Institute of Oceanography (SIO) in San Diego, California, to study. These two laboratories require different sampling procedures. Aidan uses round vacuum flasks to collect air for SIO. These are 5-liter spherical glass flasks that have a stopcock that can be opened to the air or closed to make an airtight seal. To use them, air is pumped into the evacuated flasks and then sealed with the stopcock. Aidan points out that he has to be very careful about contamination when he’s taking these samples. He must stand downwind of the flasks and hold his breath for 30 seconds to avoid contaminating the samples. Three of these flasks are filled per week and sent to the SIO laboratory for analysis. Aidan collects a total of 4 flask samples for the ESRL laboratory per week using two different procedures. Two of the ESRL flasks are filled using an apparatus that is small enough to fit inside a suitcase. Inside the suitcase is a telescopic fishing rod without the thread guides, or eyelets, which allows air to be collected from 15 feet above ground. This height helps to avoid contamination in the air sample. The air sample is pulled through a plastic tubing that is 1/8’’ in diameter. This is done through a pump, which draws air in through the tube and pumps it into the two glass flasks, pressurized at 3 PSI. Aidan Colton demonstrates the "suitcase" sampling apparatus. The other two flasks are filled by a somewhat more cumbersome method: connecting them to the inlet line of a stationary, continuous CO2 monitor that takes air from the top of a 40 meter tower. The inlet line that extends all the way to the top of the tower fills the flasks with air from a much taller height, making it an even more pure sample. These flasks are then sent to Boulder for analysis. Because it is not possible or feasible to put a continuous CO2 monitor at every site, by collecting flask samples through the same inlet line, the researchers are able to verify how the flask data correlates to the instrument data and use this correlation to verify the accuracy of the thousands of flasks that are collected around the world. Step 1: Collect air sample. The air inlet for the monitoring experiments is on top of the huge 40 meter tower by the observatory. The pumps in the main building continuously draw air samples through several long, thin, plastic tubes that are only about .6 cm in diameter. These tubes carrying air from the tower enter through the ceiling of the main building and bring this continuous sample of air to the carbon dioxide monitoring equipment. Step 2: Remove water from the sample. The air is pumped into a “freezer trap,” which cools it to -79°C. This is cold enough to freeze all of the water vapor out of the sample, but not cold enough to freeze the carbon dioxide. The very tall tower at MLO. Step 3: Infrared Absorption. After the water vapor has been frozen, the remaining air is pumped into a small cylindrical cell that has windows on both sides. Infrared light enters through the window, goes through the cell where the collected air is, and then exits out the other window, where a detector measures the level of infrared radiation. Because CO2 absorbs infrared light, this technique is very useful for measuring the amount of CO2 in the air sample. The more CO2 in the cell, the more infrared radiation that is absorbed, leaving less for the detector to measure. Step 4: Calibrate the equipment: Just to be certain that the equipment is accurately measuring the amount of carbon dioxide in the air, there are prepared samples of CO2 gas that are used to test the equipment every hour. To calibrate the equipment, all the air is pumped out of the test chamber. Two samples of gas with known percentages of carbon dioxide are pumped into it, one at a time, from steel gas tanks. One sample has a higher percentage CO2 than the outside air, and one has a lower percentage of CO2 . By comparing the temperature of the air sample from the atmosphere with the temperatures of the two prepared samples, the researchers can precisely measure the amount of carbon dioxide in the air. Data from the experiment is stored directly on magnetic tape cassettes for computer analysis. However, the results are also recorded on a strip chart recorder as a back up. The chart recorder does not directly tell what the concentration of CO2 in ppm is. Instead, it records a voltage reading that is then translated into a ppm concentration value that is based on the known CO2 concentrations of the standard gases. Air tubes from the tower enter through the the ceiling. The air is first pumped into this freezer (top left). Gas from these other tanks is used to calibrate the equipment. Carbon dioxide monitoring is just one of the projects being conducted at the observatory. All the major factors that contribute to global climate change are being continuously monitored. These include the atmospheric concentrations of methane, nitrous oxide, chlorofluorocarbons (CFCs), and upper atmosphere ozone, as well as measurements of sunlight, especially ultraviolet energy. Because the trip up the mountain is so long, staff members drive up only twice a week, where they help take observations for all the different monitoring programs in shifts. Running those programs requires of a team of seven people under John Barne’s direction, with each person specializing in a specific area. For example, while Aidan Colton is responsible for the air flask collection for the carbon dioxide program, Paul Fukumura-Sawada, an electrical engineer, studies solar radiation and works on meteorology projects. In addition to the regular staff members, there are also frequent visitors who make the trek up to MLO. Many of the larger groups are visiting college and high school students who are curious to see the research process first hand. Other smaller groups include tourists and various educators. Of course, MLO also draws a lot of attention from the scientific and environmental communities and has been the location for various conferences and summits. In 2011, the Conference on Climate and Air Quality took a day trip up to MLO. In 2010, the Chinese Meteorological Administration visited MLO for several days as fellow scientists learned more about how to set up green house gas monitoring stations. Darryl and Poai working together. Mauna Loa Observatory isn’t just a place for PhDs and postdoctoral researchers: it is also a training ground for many interested college undergraduates and even high school students. In fact, MLO is where Darryl Kuniyuki, the current station manager, got his start. Back in the early 1980s, MLO had a “Junior Fellow” position open and was hoping to find a science student to fill it. Nominated by his science teachers, Darryl was interviewed for the job and got it! He started work at MLO in 1982, plotting data and helping researchers with observations. After receiving his BS in Electrical Engineering five years later, he stayed as a full time employee. Today, he helps manage the station, make sure the IT is up to date and running smoothly, and keeps track of the observer schedule to make sure all shifts are covered. Each week, electronic data and physical gas samples are sent thousands of miles from the Mauna Loa Observatory office in Hilo, Hawaii, to Pieter Tans' group in Boulder, Colorado. Most of the data analysis for the project takes place here. Each sample of air is analyzed for a variety of gas species in the ESLR lab. To measure the amount of CO2 gas in the sample a small amount of the sample is put into a small cell with a glass window on either end. The cell is then hit by a beam of infrared radiation, which passes through the sample from one window to the other. To calibrate the measurement, the samples from Mauna Loa are constantly compared against cells containing known concentrations of CO2 gas. When the infrared beam passes through the cell, the CO2 gas inside absorbs some of the energy and expands. A detector measures the beam of radiation emerging from the cell to see how much energy it has lost after passing through the gas. Through a series of calculations, that number can be translated into the amount of CO2 in the sample. Comparing the measurement with the reference sample also helps them determine how much CO2 is in the sample. The ESLR laboratory receives samples from seventy sampling stations all over the world. From these, the team can calculate a global average for the amount of CO2 in the atmosphere. 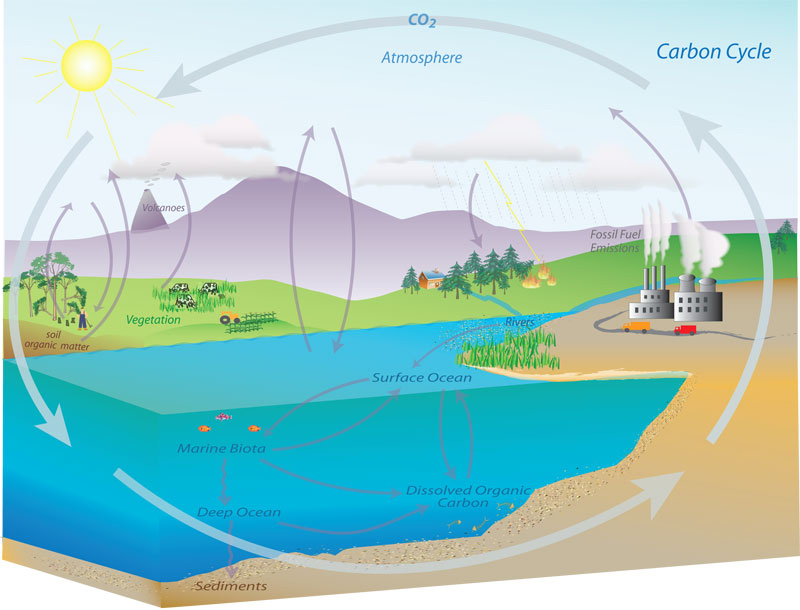 They also create something called the Marine Boundary Layer Reference, a time and latitude specific recording of CO2 concentrations, which can be used as a reference for other measurements and to help generate the global average. Peiter Tans praises David Keeling's initial decision to create a sampling station at Mauna Loa. Over the past fifty years, the monthly mean concentrations of night-time ocean air sampled at the observatory closely tracks calculations of the global average amount of CO2 in the atmosphere and the global rate of CO2 . Scientists around the world are working together to continue David Keeling's legacy of continuous, calibrated CO2 sampling. Which source do you think has a greater concentration of carbon dioxide: your breath, exhaust from a car, or the air in your classroom? Determine whether or not you are right by first taking gas samples and then testing the samples to determine which has a greater concentration of carbon dioxide. Tracking Carbon in a Warming World (2014 March 20; 24 min).